Dennis Ashbaugh states that "biotechnology has reshuffled our concept of time by opening frightening new doors. It's altered what we eat. It's altered the face and future of our planet." Ashbaugh has explored DNA imagery in his work since 1987. His large, vibrant paintings or “gene portraits” fuse and explore the traditions of abstract art with cutting-edge scientific technology. Ashbaugh is a Guggenheim Fellowship recipient, and his work has been featured in solo exhibitions in New York City at the Whitney Museum of American Art and P.S. 1 Contemporary Art Center. His work is included in the collections of the Metropolitan Museum of Art, New York City, the Museum of Fine Arts, Houston, and the Hirshhorn Museum and Sculpture Garden, Washington, D.C. He collaborated with William Gibson on the critically acclaimed electronic poem, Agrippa (A Book of the Dead) (1992). An exhibition brochure with an essay by Barbara Rose is available upon request. Rose is an art historian and critic known primarily for her writings on 20th-century American art. She is the author of American Art Since 1900 (1967), along with more than 20 monographs on artists including Joan Miro, Claes Oldenburg, and Robert Rauschenberg. Her new book Monochromes (2006) is being published by the University of California Press, Berkeley. Rose is curator of the comprehensive Ashbaugh exhibition that begins its tour next year at the prestigious Institute Valenciano de Arte Moderno, Valencia, Spain, directed by Consuelo Ciscar. The question of whether abstract art is anything more than decoration or good design plagued first generation New York School artists. To study the question, in 1948 Barnett Newman, Robert Motherwell, and David Hare founded the Subjects of the Artists school where the principal topic was the troubling issue of content in abstraction. Their discussions could be summed up in the words of Mark Rothko, who contended that there is no such thing as a good painting about nothing. As unfashionable as this idea may be in the current climate of media driven ephemeral “styles,” this is what Dennis Ashbaugh believes. Ashbaugh, who was born in Red Oak, Iowa, in 1946 and educated in southern California, has translated the surfers’ taste of high risk adventure into a paradigm for making cutting edge art. A contemporary of the conceptual and media based artists, Ashbaugh rejected the idea that minimal art shut the door on painting. His efforts to keep painting alive and moving in a time when it had been pronounced not just moribund but dead and buried isolated him from the mainstream as it was defined by museums and galleries at the end of the twentieth century. The interplay between conservatism and radicality in Ashbaugh’s art is a curious paradox, but it is also what keeps his works consistently interesting and unpredictable. They have nothing of the nose thumbing irony of Marcel Duchamp, but he seems to have taken Duchamp’s advice that to be innovative, art had to look elsewhere than at art for inspiration. For Duchamp, this was literature and philosophy; for Ashbaugh it has been genetics and biotechnology. The idea that science could provide imagery for abstract art is not new. In the Forties, William Baziotes found inspiration in marine life and Barnett Newman surely looked at biology texts when making his watercolors of the late Forties, which led to his fully developed abstractions. Indeed, good artists are actually not immune to what is going on outside the ivory tower. Often, however, it is not obvious what their sources are. For example, in the case of Jackson Pollock, who along with Newman is Ashbaugh’s most important inspiration, art historians have curiously ignored the fact that the intricate and explosive imagery of the “drip” paintings was inspired by new technology permitting macrocosmic and microcosmic structures to be photographed. These photographs, published by LIFE magazine at the time Pollock painted his cosmic abstractions, were an important source for their striking imagery. Like Pollock, Ashbaugh is keenly aware that innovations in technology require a thoughtful response from artists who are awake to their own time. Ashbaugh’s initial involvement with scientific processes were paintings based on the principle of hybridization, which grafted images from different painters—for example Mondrian and Pollock—to create a mutant offspring. He first began thinking about the breakthrough in genetics and biotechnology in the late Eighties. 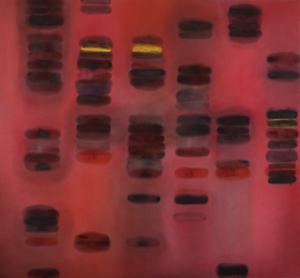 In 1990, Ashbaugh began using DNA sequencing documented by digital imaging as a basis for large scale paintings, often the size of Rothko’s, Newman’s, and Pollock’s mural scale works, of layered stains that drift through an ambiguous atmosphere which has its antecedents in J.M.W. Turner’s paintings of smoke and mist as well as in Joan Miro’s cosmic imagery. Their sophisticated acknowledgment of pictorial tradition differentiates Ashbaugh's genetic “portraits,” from the current craze for mechanical digital prints of DNA material. In 1992, he began a series of works based on computer viruses which led to a collaboration with science fiction writer William Gibson, who coined the term cyberspace. The result was the Book of Agrippa, whose pages, like computer data, could be irretrievably erased. The eaten away pages of Agrippa parallel the series of works painted in the mid Nineties inspired by “black holes”, whose cracked surfaces intimate apocalyptic meltdown. The technique by which they were produced involved various technical experiments, including embedding iron filings in matter and burying the paintings so that their phospherent pigments would crack permitting the crust beneath to appear, just as geological phenomena may burst through the earth’s surface. In Ashbaugh’s most recent paintings, marine forms interlock and the camouflage of tropical fish as much as the ubiquitous pattern of combat uniforms are referenced. Considering biology and genetics as sources for iconography permits serious artists, who acknowledge that pop culture is no longer a relevant resource, to access imagery that resonates with a large audience. To hook art back into the general culture, Ashbaugh, along with other leading artists, looks to science for inspiration. He is careful, however, not to confuse technology with science or information with progress, nor to forget that the decision to keep painting means a responsibility to its history as a medium of expression.